It's almost 2014, already? What happened to 2013? What did we do in the past year? It's all a blur. How can we write our annual Holiday letter? Wait... something's coming back to me... Toetie & Phil. Where? Was it South or North Carolina? Oh, that's right. Both. And, their timing was excellent. Visiting SC in January and NC in October... right at the peak of leaf season. Now, I'm remembering a gospel choir. Yes! Mary & Gaylord were in SC in January as well. Mary found a write-up of a Martin Luther King birthday celebration in one of Charleston's historic churches. Traffic? Lots of traffic! Where? OK. DC. We made a quick trip for Mike's great aunt's funeral. 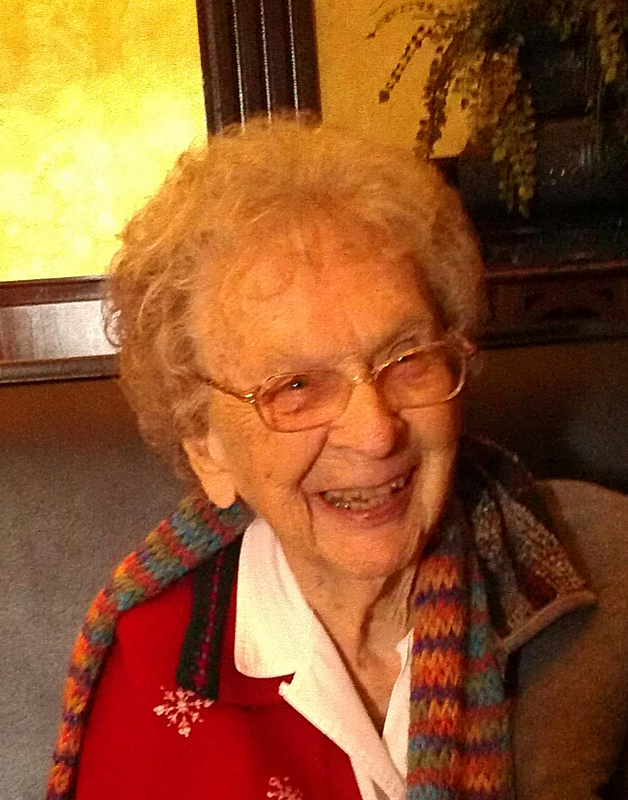 She passed at 106; a long suffering Redskin's fan. I'm seeing an awards ceremony. For Beth. The City of Charleston presented her with a Volunteer Award for her work with the children at the East Side Community Center. Way to go, Beth!!! Blank! Can't remember anything else. Maybe another photo will help bring something back... Whoa... that's pretty strange. Oh, yes, Okefenokee. We drove through on the way back from our Yearly Meeting of Quakers in Florida. 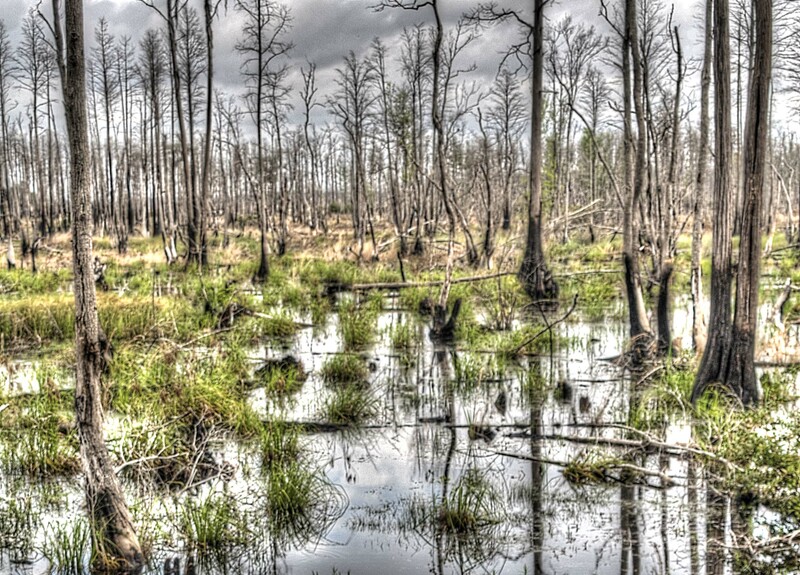 We must explore Okefenokee more sometime. And, we stopped in Atlanta. Stayed with Paula & Merrill. Guided tour, by our own private docent, of a great exhibit at the High Museum - "Frida & Diego: Passion, Politics and Painting"
Children? At our house? Isabel and Luke visited us. They brought their parents, Bo & Kyle. Our favorite quote from then. Isabel to her sleeping dad, "When you wake up, would you like some coffee?" Secret service men! Everywhere!! Are we having a bad flashback?? Nope. We visited Leslie & Jim at their new Madison Park condo, which is a couple of blocks from the Obama's Hyde Park home. New Orleans? We definitely have problems remembering the wedding there. Not in NOLA? Chicago. Yes, Chicago. A reunion dinnner with some of the wedding attendees AND the groom's parents. Time for another reminder photo. Yikes! What creature is this? I got it. 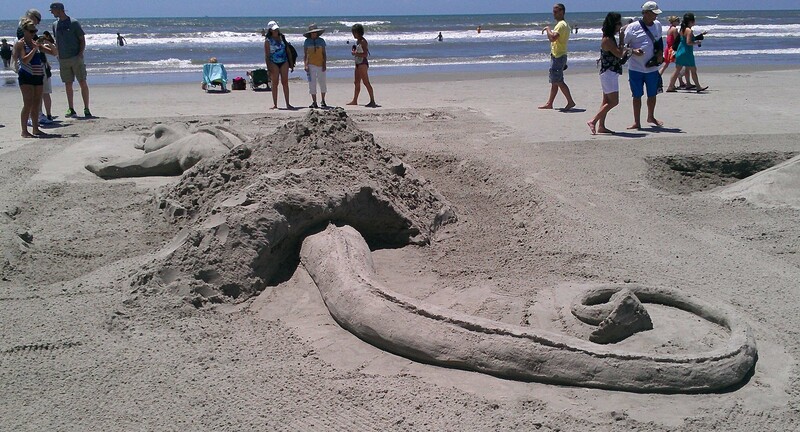 An entry in the Spoleto Sand Sculpture contest. Denny and I did our own unofficial judging. It was a perfect day for it on the IOP beach. Joshua Bell. He looks older. He is older. And, he is in Brevard. Great concert. Stayed with Carol & David. 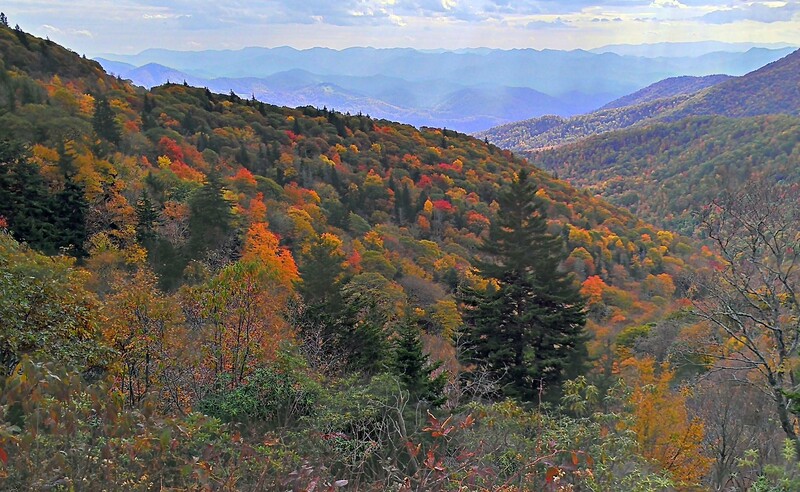 Attended another great concert at the Brevard Music Center, the Mountain Song Festival. Then, there's a gap. A long gap. Beth went to Rolla, MO for an ENTIRE month. Beth helped her mom transition from the rehab center back to her apartment. Mom will be 99 the day after Christmas. We spent this Thanksgiving in Rolla. Beth cooked duck. On the way to Rolla, we visited Sue and Bob in their new place near Nasheville. Also got a tour of their son Kevin's home and acerage. Beautiful country. Water. More water. 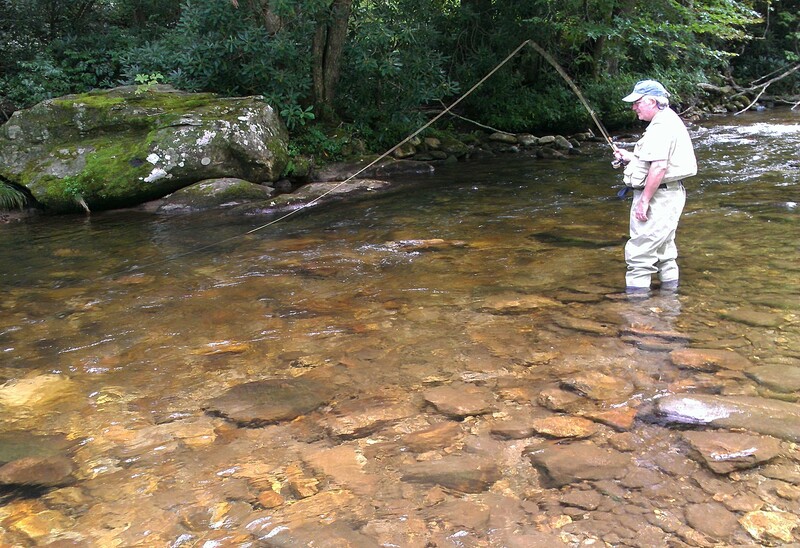 Mike did do some fly fishing with David. But, this water is in the house! Bad deal!! Bottom line... we replaced the main line from the NC cabin to the septic tank. Yet more water. This time from the sky. Tons of rain. Drove in rain for days to New Hope, PA. Beth's cousin Sara was to be married to Yiannis. The wedding was OUTDOORS!! The morning of the wedding the rain stopped. Well, that's about all we can recall. However, we did see it said somewhere, that, "you can pretty much get away with anything, if you call it a senior moment." So, if some of our 2013 memories don't agree with yours, we'll play the senior moment card. If any of you are to receive this card / letter in 2013, we'd better start stuffing some envelopes. PS Please see the online version, http://the-eddys.com/Holidays/. Click on links or pictures to expand.